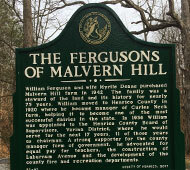 William Ferguson and wife Myrtle Deane purchased Malvern Hill farm in 1942. The family was a steward of the land and its history for nearly 75 years. William moved to Henrico County in 1920 where he became manager of Curles Neck farm, helping it to become one of the most successful dairies in the state. In 1936 William was appointed to the Henrico County Board of Supervisors, Varina District, where he would serve for the next 17 years, 11 of those years as chairman. A strong supporter for the County Manager form of government, he advocated for equal pay for teachers, the construction of Laburnum Avenue and the development of the county fire and recreation departments.